I led off at Pontotoc Lounge for D-RANKS with B-RAD at Sunday brunch yesterday. It was good to see the folks from City Tasting Tours leading a tour there. If you’re a foodie, the tours are a great way to discover the cuisines of Memphis. The tours make several stops, with a different small plate at each stop. They were headed to Rizzo’s after they got done at Pontotoc, an excellent choice as well. I didn’t eat at Pontotoc, but the people next to me had the bagels and lox and it looked fantastic. You get a whole bagel with smoked salmon with capers, onions, tomatoes and cream cheese. After Pontotoc, I stopped by Blind Bear, then over to the Majestic Grille to eat. There are very few menu items at the Majestic I have not tried, but yesterday I found one… the sausage and cheese plate. 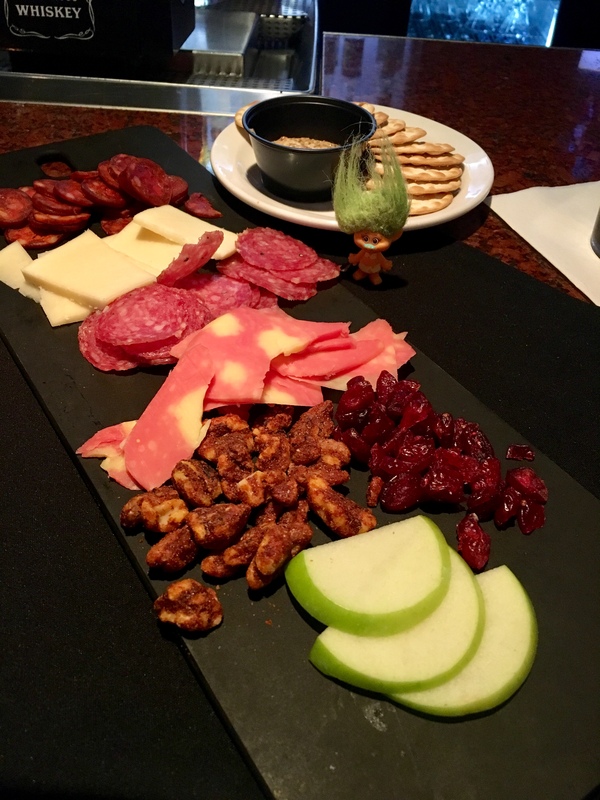 It’s a chef’s selection of meats & cheeses along with Dijon, crackers, apple slices, BBQ walnuts and cranberries. The BBQ walnuts are the star of this show. All delicious. Nice to be able to discover something new at a restaurant I’ve been frequenting for 12 years. It’s kind of like finding money in my coat pockets. 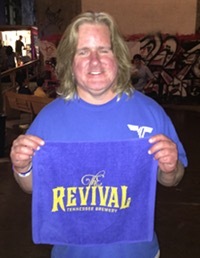 The Commercial Appeal has a photo album of last Saturday’s Memphis Brewfest. The Memphis Medical District Collaborative will have its annual meetup at the Balinese Ballroom, 330 N. Main, on Wednesday, April 25 6-8 PM. They will look back at successes of the past year and forward toward plans for the future, and you’ll get to meet the people who have made the Medical District a more vibrant place. Get free tickets to the meetup here. If you work near a Hardee’s, they’ll be giving away free sausage biscuits (one per person) tomorrow, Tuesday, April 17 from 7 to 10 AM. Excellent, excellent decision by the Memphis Flyer: They are adding a regular feature called Rassle Me in which Kevin Cerrito will cover professional wrestling. Sad to hear about the declining health of Barbara Bush. What a grand lady. That’ll do it for now. I haven’t been to Brittini’s bar at Silly Goose in a couple of weeks, so I think I’ll do that for happy hour after work. Back tomorrow with more news.